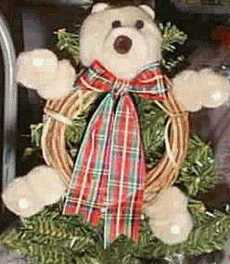 Small pom poms and a bit of glue create this country bear on a twig wreath to trim your Christmas tree. To make the bear’s head, take the 2-1/2 inch tan pom pom and in the center, separate the fur and glue in the 1 inch tan pompom. On top of the 1 inch tan pompom, glue in the 1/4 inch brown pom pom in. This is the bear’s nose. Right above the nose, glue the 2) 1/8 inch black pom poms for the eyes. Now attach the 2) 1/4 inch tan pom poms separating the fur on the 2-1/2 inch pom pom and glue them in for the ears. Attach the head on the top of the twig wreath. Glue 2 each of the 1 inch tan pom pom for the arms and legs, separating the fur when gluing together. Attach the arms and legs in place as shown in the picture. Now add to each arm and leg the 1/8 inch pink pompom to the last 1 inch tan pom pom as palms of the hands and soles of the feet. Glue the arms and legs in place on the twig wreath. Make a bow with long tails, glue to the neck and tack down the two tails to the bottom of the wreath with two spots of glue. Attach a loop of elastic string (silver is nice) to the back of the twig wreath thru one of the top branches. Enjoy !